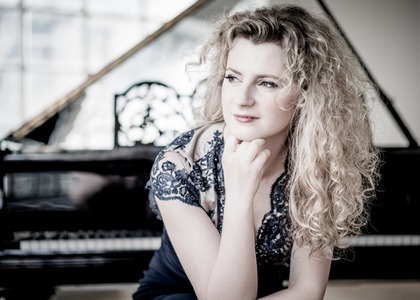 Pianist Alexandra Silocea is holding a concert together with the Engineers' Orchestra 'Petru Ghenghea', under the baton of Andrei Iliescu, on the 17th of March. At the end of the month she will have her debut in Finland. You've already held a concert with the Philharmonic Orchestra from Bacău. How would you describe the collaboration with conductor Anastasios Symeonidis? My collaboration with conductor Anastasios Symeonidis was a very good one. I truly admire his professionalism and his patience, which is something every single soloist needs from a conductor. On Sunday, the 17th of March, you are performing on the stage of the Romanian Athenaeum. Why did you choose this particular piece for this concert? I chose this concerto because I really love it and of course that I've always tried to choose a piece I like, and I do believe that the Romanian audience loves this work too. When I chose this concert, I had no idea that I would perform Beethoven's Piano Concerto No. 3 three days before. Two concerts in Finland are coming up. How did they come to be? Three days after my performance in Bucharest on the 17th of March, I'm going to Finland to perform with the fantastic Kymi Sinfonietta and conductor Leo McFall. These concerts were organized thanks to the conductor. I can't wait for this debut in Finland. We'll be performing Concerto No. 17 in G Major, a concerto we've already performed some years ago, first time we worked with the London Philharmonic Orchestra and Vladimir Jurowski. What other projects are coming up for you in the near future? The next projects will take place in Romania. On the 2nd of May, I'm coming back to Sibiu with the Philharmonic Orchestra and Maestro Galaţi and I'll perform Concerto No. 1 by Beethoven, then I'm heading to Austria, to perform at the Mahler Festival, in a solo recital, but also with singer Matthew Rose. Then, of course I'll be performing at that thelong-awaited 'George Enescu Festival', on the 11th of September, with the Academic State Symphony Orchestra of Russia 'Evgeni Svetlanov' and Maestro Vladimir Jurowski. It's a great joy for me and I'm deeply honoured to perform once again with this amazing conductor and his long-beloved orchestra.